Nobel Peace laureate Mairead Maguire wrote today [7 Jan 2019] to the Norwegian Nobel Committee nominating Julian Assange, Editor-in-Chief of WikiLeaks, for the 2019 Nobel Peace Prize. “This is a huge step in our work for disarmament and nonviolence worldwide. Julian Assange, fearing deportation to the U.S. to stand trial for treason, sought out asylum in the Ecuadorian embassy in 2012. Selflessly, he continues his work from there increasing the risk of his prosecution by the American government. “In recent months the U.S. has increased pressure on the Ecuadorian government to take away what remains of his freedom. He is now prevented from having visitors, telephone calls or other electronic communications, thereby removing his basic human rights. This has put a great strain on Julian’s mental and physical health. It is our duty as citizens to protect Julian’s human rights and freedom of speech as he has fought for ours on a global stage. “It is my great fear that Julian, who is an innocent man, will be deported to the U.S. where he will face unjustified imprisonment. We have seen this happen to Chelsea (Bradley) Manning who allegedly supplied WikiLeaks with sensitive information from NATO/US Middle Eastern wars and subsequently spent multiple years in solitary confinement in an American prison. If the US succeeds in their plan to extradite Julian Assange to US to face a grand jury, this will silence journalists and whistle-blowers around the world in fear of dire repercussions. “Julian Assange meets all criteria for the Nobel Peace Prize. Through his release of hidden information to the public we are no longer naïve to the atrocities of war, neither oblivious to the connections between big business and the acquisition of resources and spoils of war. 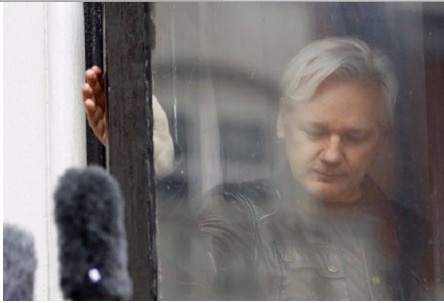 “As his human rights and freedom are in jeopardy, the Nobel Peace Prize would afford Julian much greater protection from governments’ forces. “Over the years there have been controversies over the Nobel Peace Prize and some of those to whom it has been awarded. Sadly, I believe it has moved from its original intentions and meaning. It was Alfred Nobel’s will that the prize would support and protect individuals at threat from government forces in their fight for nonviolence and peace, by bringing awareness to their precarious situations. Through awarding Julian Assange the Nobel Peace Prize, he and others like him will receive the protection they truly deserve. [Editor’s note: See also https://www.transcend.org/tms/2019/01/giuliani-says-assange-should-not-be-prosecuted/.